something has to be done. But will she risk her career and her integrity to expose the truth? 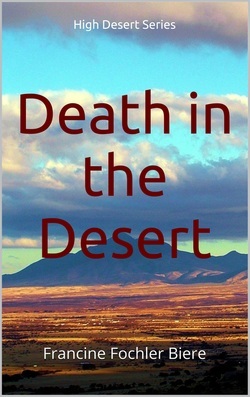 Death in the Desert is now featured on the web site, That Part Where. There's a longer synopsis and a free chapter available there. You'll also find other great books on that site. sifted through the dust. Other groups scampered through the desert terrain as well. "Come," their guide hissed and scurried into the dark without a backward glance. They silently followed, putting distance between themselves and the border. tracked like animals, their only chance of evading capture was to follow the coyote's directions. "Faster," the coyote growled, gesturing for them to follow. They stumbled into a small clump of mesquite trees and crawled behind a tall stand of buffalo grass. The coyote used broken branches to sweep away their footprints. held her breath, as if that might prevent their group from being discovered. She shifted her weight and a sinewy hand grabbed her arm. "Do not move." Alejandra froze at the strength and hidden threat in the coyote's guttural voice. She was beyond fear. directions without question, he would lead them safely to their destination. to find jobs, work hard, and make better lives for their families. Many debate the reasons. I hope to shed light from a Christian humantarian perspective. 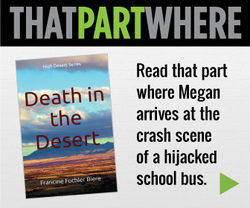 Meagan Wagner, an award-winning journalist, has settled back in the safety of Cochise County, Arizona. She has fled back to her roots in order for her to start healing from the devastation and fear that crept into her life after September 11, 2001. Living in Washington D.C. at that time, Meagan should have been covering the hysteria and chaos that surrounded the hours and days following the attacks on New York and Washington. Instead, she was glued to the television like the rest of the country. She was experiencing failure when she should have been taking pictures and writing about the experience. Back in Arizona, she has settled into her life out on the ranch with her Uncle Billy, the closest thing to a father that she has in her life. Billy, a recovering alcoholic, has managed to turn his life around after years of drifting and drinking. Now Billy has won the lottery and lives comfortably on the ranch. One thing he had the good sense to spend his money on. The other constant in his life is his niece, Meagan, who has always shown him unconditional love even when most of her love life was dry like the desert that she lived in. The quiet Arizona area that she lived in was quickly becoming the gateway for illegal immigrants from Mexico entering the United States. The area was becoming a little dangerous as the drug runners and coyotes (or paid guides) that brought the Mexicans became greedy and wanted more and more money to do these deeds. As more and more illegal Mexicans turn up dead in the desert from dehydration, the area becomes a tinderbox waiting for a spark. That spark comes and the fire of hatred and bigotry runs rampant throughout the county. Meagan is unintentionally fanning the flames with her stories. With the help of Uncle Billy and her friends, Meagan finally sees that the fear she has is running her life. Wow, this book is really a lesson in fear and how it can run your life without you knowing it. is a must read book. across the border. Every scene was believable and realistic. I found myself crying and the ending was perfect. She showed real people with real problems, like Uncle Billy. Limited print copies available upon request.